Boil the pasta in a large pot of salted water until al dente. Drain, reserving 1/2 cup of the pasta water. Heat the olive oil in a skillet over medium-high heat and stir the minced garlic for 1 minute. 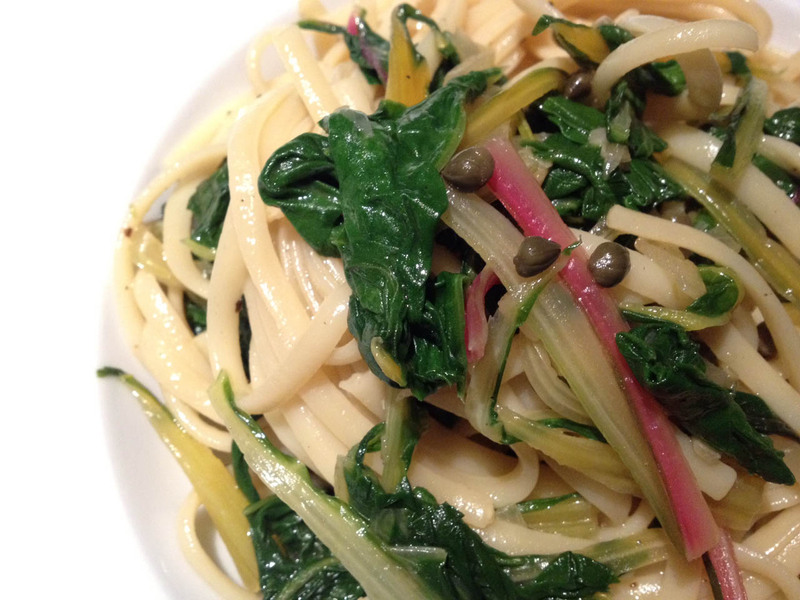 Add the Swiss Chard and cook quickly until stems are tender but leaves are still bright green. Add a small amount of the pasta water to help steam the greens. Pass hot water through the pasta to loosen, drain, then stir into the pan. Add the capers and lemon juice, season to taste with salt and pepper. Toss well and plate, grating Parmesan cheese over each. Serve immediately.